All along I thought I would read one of my Jane Urqhart books for the letter ‘U’ in my A-Z CanLit Project. But no, I couldn’t be sensible – I had to ignore the five Urquhart novels I have on my shelf and search the library for a book and author I’ve never heard of . Isn’t that more fun? But it paid off – this was such a great book that I would never have encountered if not for my ‘foolishness’. I took three pages of notes while reading this book; a good thing since it’s been over a month now since I read it, and a bad thing because I really don’t have time for all that. But the book was full of fun tidbits of information about the lives of the people in the story and what happened to them on that fateful day, as well as other events in Canadian history that happened near or around the time and place of this one. 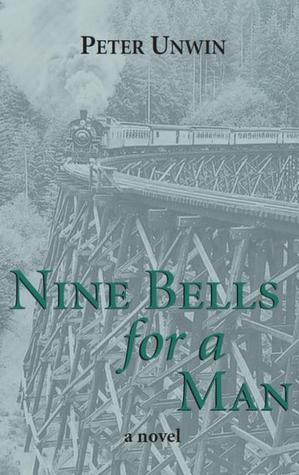 Nine Bells for a Man is a fictional account of the sinking of the Mayflower, a small steamboat that traversed the waters of Lake Kamaniskeg, and the passengers who were on board. The book starts out with the men tossing about in the cold water, trying to stay alive. Then it goes back to Saskatchewan and how it all started. Knowing full well what is going to happen had me on edge the entire time, like I could somehow intervene with my mind. The wind cuts across the water and slashes at them. A slushy membrane of ice laps against their throats, breaks open in the chopping waves, and slides together with a terrible hiss… For a quarter of an hour they have clung together to a pine box without uttering a word. Except for the wracking yawns of hypothermia they’ve ceased making the sounds the others had, the exhalations that turn into screams, arrested shudders that seared out across the lake and then stopped, one after another. Before we even know these men, we feel terrible for them. But then the book takes us back in time to introduce us to everyone, and then it’s even more horrendous to think about. I was especially rooting for the poor young man from Saskatchewan, just doing his duty by bringing home the corpse of his beloved wife’s brother. He had never been away from home before and was feeling homesick the whole way along, wishing to be back home again safe with his young wife and child. But don’t be scared off by how harrowing all this sounds – there is actually quite a lot of humour in the book, which kept me smiling to myself and reading on. One of the main threads of humour and discord between the characters was about the East versus the West. Oliver Tunney didn’t figure anything could taste better than a Saskatoon once it had been roiled up in a vat of jam, and he assumed that Herman Brown was making the thing up about blueberries. Probably there weren’t such a thing as any blue berry. Probably the same as with those Pickerel fish, too. He was just sick of hearing about the East. He had not imagined so much water lay upon the earth. His wife had spoken of it; words describing steamboats, canoes, swimming, fishing, trout that schooled at the bottom of enormous lakes. But he never imagined water like this. It spoke to him of the East somehow, of wealth hoarded, of wealth beyond necessity, and of greed; as though somehow men had conspired to keep water hidden here for their own selfish purposes. It wasn’t what a man had that showed his mark, it was what he didn’t have, what he could do when he had nothing at all. Not even water. He watched the businessmen and the travelling men as they boarded, and kept his eye out for ladies in the hoopless skirt the newspaper had warned him about. He had read an account saying city women were as naked as Eve, wearing these new skirts. But Pachal did not see any naked women. It seemed to him the women had on as much clothing as they ought to have for November. It remained a mystery to him; the constant speaking of words between people. Even in the desperate survival scenes, the book is gently humorous. It describes the boat sinking from each passenger’s perspective, then moves on to the survivors clinging to the coffin who eventually reach the shore. Once pulled up into the woods, the men have to figure out how to stay alive in the cold wet November conditions until discovery (if discovery ever happens). They take turns wearing the warmest coat, slap each other awake when feeling drowsy, and spend three hours blowing on a cigarette lighter to dry it enough to attempt to start a fire. All Robert Pachal knew about water was that it fell down on him from up top, or lay like clear glass marbles on the leaves of alfalfa, and damped the wheat stooks into a dark shade of tan. It did not come up from underneath him, like blood oozing out from a wound. Sometimes it runnelled down the side of a train window, like a series of clear tongues, or lay in deep black pools in the rock holes of north Ontario. He’d seen that himself, on his travels… But it did not heave up at a man and swallow sections of a boat in front of his very eyes. Harper’s hands were visible and naked against Peverly’s coat. He couldn’t feel them at all. Nor did they hurt in any particular way. They just didn’t exist, except as two white claws grappled to a coat, extending like bones into his own sleeves, where they disappeared. He doubted if they were attached any longer to his body. The instrument was passed from one man to the other in turns, and in turn they fired their breath onto it. Harper’s buffalo coat moved in the opposite direction. They huddle on rocks, trying to spark life into Joe Harper’s automatic gas lighter. They pressed insensate fingers to it; Harper’s thumb grew cloven and dented from flicking at the stone… He held the instrument in his hand and glared. It irritated him that such an efficient-looking device could not keep men from dying. And all this, just to get a dead man back home to his family. The man lies in the plush interior of a fine coffin while four dying men and the storms of the world bang against the lid. It’s true that he had never known the supercilious air of a vested waiter like some, or the taste of a finely seasoned turtle soup. He did not know the ornate mansions of Buffalo, or the crush of humanity pressed on the platform at Union Station. But in his own reckoning what he had known was much better than any of that, for he had seen Rebecca Chiles, the third daughter of Wallace Chiles, half-undressed in a field of raspberries at twilight after a day of berrying. Her breasts lolled like two perfect puddings exposed for him alone, and her shoulders were more naked than it was possible for any man to know. All in all, I found this to be an engaging book of historical fiction. Well written, well researched, and able to keep me smiling despite the known trajectory of the story. An unexpected treasure. And I learned some new stuff about the history of my country, which I always love. This is another book I chose by browsing through the shelves at the library, under the letter ‘V’ – a collection of short stories written by Atlantic Canadian authors; some I’ve read before and others I haven’t. Because it was put together in (or before) 2003, many of these stories are written by writers who were not as well known then as they are now. Authors represented in this book are Carol Bruneau, Goerge Elliott Clarke, Christy Ann Conlin, Kelly Cooper, Libby Creelman, Michael Crummey, Larry Lynch, Rabindranath Maharaj, Lisa Moore, Peter Norman, Karen Smythe, Lee D, Thompson, R.M. Vaughn, and Michael Winter. Out of the 14 authors with stories in this book, I’ve read and reviewed books by six of them – Carol Bruneau’s These Good Hands (and have just finished reading Glass Voices), George Elliott Clarke’s George & Rue, Christy Ann Conlin’s Heave (I have also recently read The Memento), Michael Crummey’s Sweetland and River Thieves, Lisa Moore’s Caught and Flannery, and Michael Winter’s Minister Without Portfolio. Of the authors I haven’t read yet, I have Libby Creelman’s Split on my to-read list, as well as Peter Norman’s Emberton, and Maharaj’s Amazing Absorbing Boy. 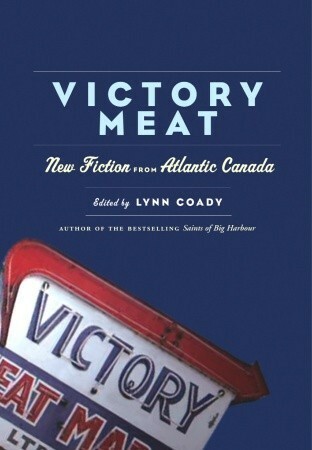 Then, of course, there is Lynn Coady, the editor of this collection of Atlantic Canadian Fiction. I’m embarrassed to say that I still haven’t read any of her books, even though, at times, I’ve had the odd one out of the library. Her short story collection, Hellgoing, won the 2013 Scotiabank Giller Prize. But I’m more interested in her novels: Saints of Big Harbour, Mean Boy, and The Antagonist. Most recently, she’s written Who Needs Books? ; Reading in the Digital Age. In this collection, you will encounter an angry immigrant who can’t find a job, women who are still in love with their lost husbands, an insomniac (who rents movies from Video Difference in the middle of the night), illegal moose hunting, a little girl whose father is living with chronic pain, a detective spilling his secrets about the ‘scum’ he encounters, a beach party gone wrong, a parade of whales, and sacrificial ceremonies by the sea. What wonderful treasures have you found at the library lately? It only goes to show that naughtiness can pay off! The Unwin novel sounds like an amazing find: how fortunate and fun that you weren’t heading towards it at all! And I love the Crummey and Mabindranath quotes! I’m game to read any of Lynn Coady’s novels (other than The Antogonist, which I’ve already read) if you ever want company; I’ve only read her short stories and I keep meaning to read the novels! Her writing’s so sharp and smart! Somehow, even though I heard you mention Victory Meat, I hadn’t put together that it was your ‘V’ selection for the project. Woo hoo: you’re almost ready to start the alphabet again! I’ll let you know if (and when) I get to Lynn Coady! I used Maureen Jennings’ mystery, Except the Dying for ‘x’ for a challenge once. I’m not sure how many other Ex- titles there might be. I’m almost afraid to think – heheh! Let me know if you think of any others! Sometimes a book is so much harder to read when you know the fate of the characters. Sounds like you found a good one here. I was surprised how much it didn’t matter that I knew how it was going to end! I did really care about that one guy, though, and the family he left behind – that was sad. Going off the agenda can be so rewarding. I’m sure that’s why I dont do well at challenges which involve reading a specific list of books – I get distracted by all the books that are not on the list…. I have the same problem, Karen! I love the quotes from Nine Bells, but I’m not sure if knowing what happens to them might not make it harder for me to care about them. Sounds like a great find for U though – good luck with that pesky X! I really lucked out with ‘U’! Maybe I’ll have the same experience with X… And Y and Z! Hmm, Nine Bells sounds interesting. I am so glad that Nine Bells has enough humor in it to keep it from being a heartbreaking slog. Sounds like it could have been a really harrowing read. As for me, I picked up a 2007 biography of Aaron Burr the last time I browsed at my county library – ever since I (belatedly) became obsessed with Hamilton the musical, I’ve been curious about Burr! I don’t know that I’ll read all of it, but I’ll give it a go! The best thing about bringing home library books is that there’s no pressure to read them! I don’t read a lot of nonfiction, but when I get it from the library, it doesn’t matter – I can just read the parts that interest me! Is it weird that I feel like I’m “cheating” at reading if I don’t read the whole thing? Quite a story about the Mayflower — I checked out the link about it. That must have been an agonizing Nov. night. I can feel the cold of it! I’m a sucker for survival tales so Unwin’s book interests me. As for Lynn Coady, some day we will have to have a readalong b/c I have not read her books yet either, but have a couple of them! I also love survival tales, which is probably one reason I liked it so much. I’ll let you know when I decide to pick up one of Coady’s books!